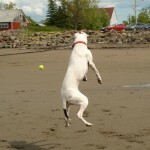 From her first attempt to one of her last, Corona, our Dogo Argentino, sure made us laugh on a sunny afternoon at the cottage. Setting up, for the first time, her complete obstacle course took more time than realizing she just didn’t have the energy to put her all into it. Corona was walked through the weave poles ok, was more than happy to sit at the pause box, quickly trotted through the open tunnel and ecstatic to sit again at the finish line. 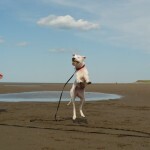 Only she couldn’t quite bring herself to make it past the first obstacle with gusto. 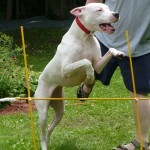 Catching her many attempts on still and video camera this Dogo Argentino will always be remembered for her jumping ability. Giving her some credit, she did swim tons already that morning and the day before so she was pretty tired. And, as can be our luck, she was vibrant the next day after we took the course down. Maybe next time we’ll start with the course and reward her with a swim! 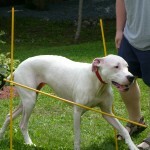 This entry was posted in Corona and tagged Attempts, Columns, Corona, Course Attempt, Dogo Argentino, Finish Line, Gusto, Obstacle Course, Open Tunnel, Sunny Afternoon, Video Camera, Weave Poles on August 9, 2009 by CoronaTheDogo.